Tuesday Topics: Has Early Access been good for PC gaming? Every Tuesday, we’ll be asking you, our lovely readers, to chime in on an important topic affecting PC gaming. We want you to open up your gorgeous brains and shower us in your thoughts. It sounds gross, but it’s totally above board. 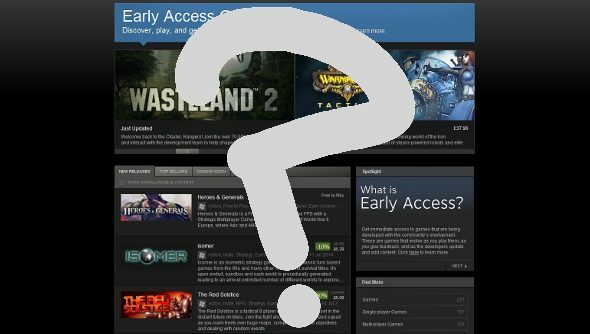 Since March last year, we’ve been inundated with Early Access titles through Steam and internal programs set up by developers. A slew of premium alphas and betas are appearing every month, ostensibly allowing players to have an active role in development, giving them the opportunity to watch as a game grows from its early stages to a complete product. But it’s become a divisive subject. Is charging for an incomplete product appropriate? Does the pricing reflect its unfinished state? And how should these games be tackled by the press? We want to know what you think. Take to the comments, and tell us if Early Access has been good for gaming. Allow me to get the ball rolling. I find the concept of Early Access to be one worth exploring. Working in the industry, I’ve been able to play countless games through different stages of development, and it’s a fascinating process. Between alpha and launch, games can be completely transformed. I like that Early Access opens this up to everyone, and in the best cases, it leads to completely transparent development and better communication between game makers and players. But it’s a system open to abuse. Some Early Access titles have been revealed to be borderline scams, and with the concept still being in its infancy, there aren’t enough safeguards to ensure that consumers don’t get played for fools. It’s not enough to say “well, you took a risk,” because it means developers don’t need to be held accountable for their product. Given time, however, I can see it evolving into something extremely positive. Indeed, we’ve already seen the positive impact. Minecraft went down this route before Early Access even existed, and that was a key component of its success. Larian Studios, developers behind the excellent Divinity: Original Sin, say that they wouldn’t have been able to make the game without Early Access and Kickstarter. Anyway, enough of me rambling. Let us know what you think in the comments.